Is it time for the First Minister to declare checkmate? Many crofters and other interested parties have been wondering for some time why the crisis within the Crofting Commission has been allowed to trundle on for so long. Why they ask is Colin Kennedy still in post as Convener of the Crofting Commission despite many alleged breaches by him of the code of conduct and calls for his resignation from fellow commissioners, representative bodies, the press and crofters. He has stated that “hell will freeze over” before he resigns. It was suggested that if he didn’t jump he would be pushed. A good few weeks later and no jumping and no pushing to be seen. The latest move in this bizarre game is that Colin Kennedy has made a formal complaint against Fergus Ewing MSP, the Cabinet Secretary with responsibility for crofting. It has been reported by the BBC that Mr Kennedy “accuses the Rural Economy Secretary Fergus Ewing of being in breach of the ministerial code“. This is rather ironic given the numerous accusations over a number of months from various parties against Mr Kennedy for his purported breaches of the code of conduct for members of devolved public bodies. A reference to Colin Kennedy retaining an active interest in and being part of the decision making process in the Mangersta and Upper Coll cases despite complaints being made against him. @sweenyness @CroftingLaw So @FergusEwingMSP should copy Convener + respond with excuse of discomfort of @ScotParl chairs + dingy lighting! A reference to Colin Kennedy’s reasons for his behaviour in response to the complaint made against him by former committee members at Upper Coll Common Grazings. Thus Mr Kennedy’s latest move may not have been as smart as he thinks. He may want to drag the agony out for everyone and cause more pain and anguish along the way. He may wish to pull others down with him. The reality is that such behaviour is not helping the greater good of crofting and the day to day regulation thereof by the Crofting Commission. various police reports, about matters on Coll, were read to the court and one said Mr Kennedy was “not averse to confrontation” and added that “by his own admission his actions can antagonise the situation”. put forward evidence in his lengthy cross-examination of Mr Kennedy, which had brought the farmer’s character into question. He produced a tabloid press report, from the mid-90s, which said fellow islanders at that time called for Mr Kennedy – who was once banned from the island’s only hotel bar – to be banned from having a shotgun, claiming that he “has awful fits of temper”. Strathclyde Police have received repeated complaints from Mr Kennedy and Mr Brackenbury, over the years, and Mr Nelson produced extracts from police subject sheets, recorded by unnamed police officers, relating to Mr Kennedy. Another police report called Mr Kennedy “an extremely stubborn individual who made it quite clear that he is intent on taking his revenge upon a number of individuals who he believes have previously wronged him”. And yet another police subject sheet, dated October 4, 2005, said: “Taking aside the 20 years of civil disputes with Mr Brackenbury, Mr Kennedy has recently embarked on a civil complaint with almost every occupant in Arinagour and his lawyers have sent letters claiming £20,000 from each of them, as compensation for their gardens and houses being built on his grazing land. This has caused considerable anguish upon Coll, especially with the elderly. 10 years later and this behaviour appears to have moved from the Isle of Coll to the corridors of Great Glen House and Holyrood. It is not behaviour befitting anyone in public office and we have surely now reached the end game. If Mr Kennedy thinks he has cornered Fergus Ewing it is time for the First Minister to swiftly move forward and declare checkmate. 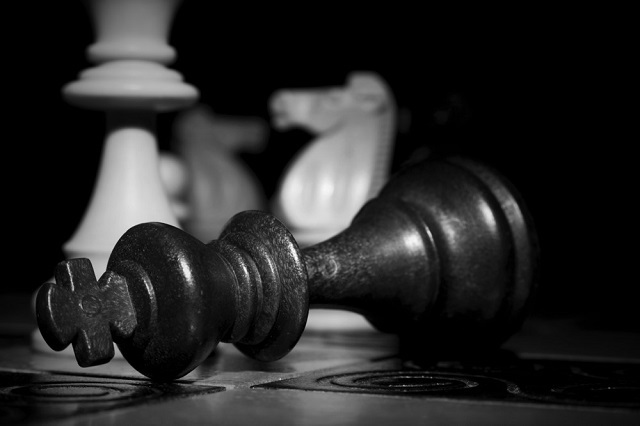 After all the Queen on the chess board, with an army of support behind her, is much more powerful than a lone ‘King’. This entry was posted in Common Grazings, Crofting Commission and tagged BBC, Cabinet Secretary for the Rural Economy and Connectivity, checkmate, chess board, code of conduct, Colin Kennedy, conflict of interest, Convener of Crofting Commission, Convener's throne, crofters, Crofting Commission, Crofting Commissioners, Crofting Minister, Fergus Ewing, Fergus Ewing MSP, hell will freeze over, Isle of Coll, John Brackenbury, Mangersta, Mangersta Common Grazings, Mangersta Common Grazings Committee, ministerial code, Oban Sheriff Court, police reports, resignation, resigns, The Oban Times, Upper Coll, Upper Coll Common Grazings, Upper Coll Common Grazings Committee on October 27, 2016 by Brian Inkster.